Rugosa Roses are one of the hardiest and easiest roses to grow not only in cold climates, but nearly every American growing zone. They are generally hardy in zones 3-9, drought resistant, salt spray tolerant in coastal zones, tolerant of poor soil conditions and very disease resistant. They are nearly immune to black spot and mildew, and actually don’t like being sprayed with chemicals, and so will be content in an organic garden. The foliage of the ‘Linda Campbell’ is much more smooth than most Rugosas. And the canes are virtually thornless! Clusters of very elegant buds open to an exceptional bright red bloom in large clusters, sometimes 25 blossoms per stem. Blooms continuously from spring until frost. Although not quite as hardy as the other Rugosa Roses, ‘Linda Campbell’ will still thrive in zones 3 and 4 if adequately protected. The tall canes are a bit more difficult to protect (see creative ideas for protection) but will grow back quickly and true from its’ “own roots”. This spectacular shrub is a real showpiece as a focal point. Stunning in groups or as a hedge, or at the back of the border. A very unusually colored hybrid Rugosa bloom, tinged with both pink and yellow. ‘Keith’s Delight’ has a tall arching habit that will climb if trained. Or allow to gracefully arch as a specimen plant. This Rugosa is definately not winter hardy, but it is such a beautiful introduction it is worth mentioning. Deadhead the spent blooms to encourage abundant reblooming. Orange hips are produced in fall. The petals of this elegant Rugosa are blushed with pink around the edges of the petals. When the blooms first open they are edged in a brighter pink, and fade to a blushed pink as the bloom matures. The large flower clusters droop slightly. It grows very vigorously, almost agressively, being prone to suckers, so give it plenty of room to spread. ‘Polareis’ blooms all summer long and has a great fragrance, and the bright green foliage is also sweetly fragrant. This is a lovely cottage garden rose, used nicely in borders and beds, hedges or as specimen plants. This Rugosa will tolerate no shade, plant only in full sun. Also known as ‘Polar Ice’. Bloom Color: Purple, scarlet red, white, lilac, pink and deep pink. ‘Pavement’ roses are German named series of very hardy and healthy shrub rugosas. Each color has its’ own German name, i.e. ‘Rotsmere Purple Pavement’, and are available in purple, scarlet red, white, lilac, pink and deep pink. The flower buds are unusually long in beautiful clusters. Large numbers of hips are produced. Creates a lovely neat hedge or wonderful in a perennial bed or as accent plants. Striking in mass plantings. ‘Purple Pavement’ is the most widely known of the pavement series. Deep purple burgundy clusters of large semi double flowers are nicely contrasted by the yellow centers when the bloom fully opens. Very large hips. ‘Snow Pavement’ has very long pink buds that open into long petals of blush white with hints of mauve pink. Blooms are clustered and are wonderfully fragrant. Foliage is bright and healthy. ‘Scarlet Pavement’ has deep scarlet red double blooms with yellow centers. Large red hips make a lovely fall display. Repeat blooms well. Very fragrant. The blooms of the ‘Roseraie de L’Hey’ are exceptionally stunning. Long elegant buds open into large double blooms in clusters. The blooms repeat well, with blooms continously present. This shrub rose is very easy to grow. Will tolerate a heavy clay, but best to amend it with loam. Excellent back of the border plant, hedge or specimen plant. Give it plenty of room, left unpruned ‘Roseraie de L’Hey’ has a wild and bushy form. As a hedge it wil be dense and impenetrable. Unfortunately it produces no hips, but the fall foliage is golden and quite lovely. Rugosa ‘Rubra’ is the wild rose often seen growing along the seashores, along with Rugosa ‘Alba’. This is undoubtedly the hardiest rose to be found. Water well until they are established, then the should only need water in drought periods. They are partial to manure and top dressings of kelp meal, do not use commercial fertilzer as they leaves will burn. ‘Rubra’ will sucker easily and form a nice hedge. They are perfect to prevent soil erosion on banks. They will also reproduce easily from seed and set very large red hips. Bees love the blooms. Also known as ‘Snowdwarf’, this Rugosa has lush full foliage and will tolerate part shade. ‘Schneezwert’ is a lovely small member of the Rugosa family. Fragrant semidouble pure white flowers are produced in large quantities. Red hips are produced in fall, often while blooms are still present. This is a very hardy rose, tolerateing some shade and poor soil conditions. Excellent in groupings or as a hedge. Will also do very well in a container or large pot. Disease Resistance: Very resistant, somewhat susceptible to powdery mildew and rust. 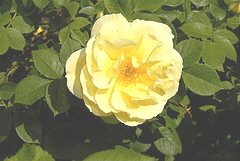 A reblooming yellow rose with arching branches, reblooming freely all season. The blooms open in a rich yellow and pales to a warm soft yellow as the bloom matures. It drops it’s petals, so no need for deadheading. ‘Topaz Jewel’ needs a couple of seasons to establish well, then will grow vigorously. The blooms will then last longer and exude more fragrance. Exceptionally hardy, disease resistant and tolerant of neglect. May need protection for top growth, since the tall canes are often not reliably snow covered. However, pruned back canes regrow quickly. May be hardy in zone 3. Lovely as specimen plants, shrub borders or mass plantings. Bred by Canadian Skinner with a Bourbon rose parent, ‘Wasagaming’ is a very good repeat bloomer outperforming other Rugosa roses. The shrub grows vigorously with little care and will tolerate some shade. The deep pink very double blooms repeat well. The compact form creates a nice low hedge, bedding plants, groupings or foundation plantings. ‘Wild Spice’ produces a profusion of ruffled, snowy white blooms all season , well into fall. The shrub is bushy but graceful and will form a lovely low hedge, or use as bedding plant or foundation plantings. . Orange hips are produced abundantly in fall.